Reading The Game: 'What Remains Of Edith Finch' : All Tech Considered Our occasional series on storytelling in video games continues with What Remains of Edith Finch, a complex, time-skipping family tragedy that'll leave you with scars — but trust us, it's worth it. What Remains of Edith Finch is a time-hopping family tragedy that centers on a spooky old house. For years now, some of the best, wildest, most moving or revealing stories we've been telling ourselves have come not from books, movies or TV, but from video games. So we're running an occasional series, Reading The Game, in which we take a look at some of these games from a literary perspective. Sometimes you have to be ready to have your heart broken. Sometimes you have to be prepared for it. To go out into the world armored and girded for battle, knowing that it is full of terrible things that will move you, hurt you and maybe break you, but to go despite that knowledge. Because to do otherwise would be surrender. Cowardly. A waste of the life given to you. Sometimes you know the heartbreak is coming. Sometimes it's a surprise. That doesn't matter — the scars look the same either way. Sometimes the wounds are temporary, and the hard parts of you shrivel and drift away like autumn leaves. Sometimes they're forever. They become a piece of you, and you'll carry them with you wherever you go. 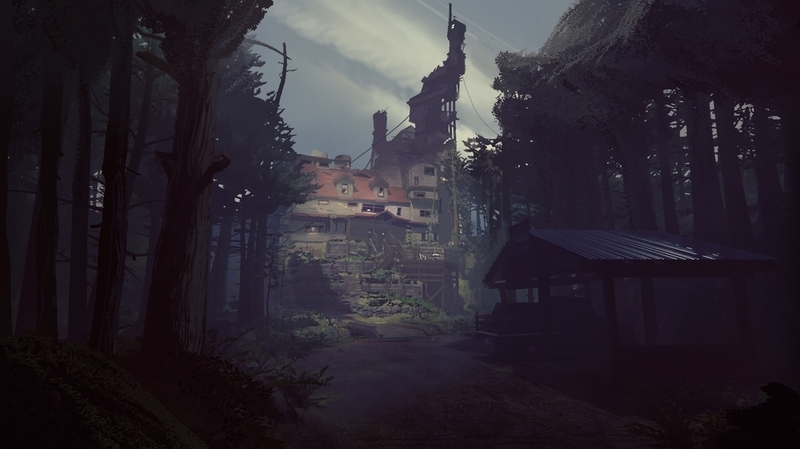 What Remains of Edith Finch is going to hurt you because it's a game about being hurt. Just know that before you start. Depending on who you are, what you bring with you to the game, different pieces will break you in different ways. Some you'll shrug off. But others ... no. There are moments in this game — this little indie game-that's-not-quite-a-game from Giant Sparrow — that are like swallowing tiny bombs with untrustworthy timers. They might not go off immediately, but they will go off. And when they do, the psychic shrapnel will tear you to pieces. The basics: Edith Finch, the protagonist, comes from a family that is cursed. Generations of them have died before their time, often in unusual and tragic ways. They are strange, the Finches. Insular. Haunted by more than their share of ghosts. And at one time or another, they have all lived in one house buried in the drippy greenness of Washington State. Once upon a time, Edith's mother tried to take her away, to outrun the family inheritance, as it were. She'd already lost two sons (one very much dead, another simply gone missing, but permanently), and wasn't about to give up her only daughter, too. But it doesn't work. Edith comes back, years later, to explore the impossible bounds of the family home — this twisting, layer-cake of a thing, made of castles and crashed airplanes. She wants to understand what happened to her family. To see if the curse is real. Edith Finch (the game) is like a nested collection of short stories, curled around each other like snakes in a jar. Each one is unique, linked by blood (a brother here, a father, a cousin), and all of them share one terrible, final thing in common. They all end in death. Edith Finch (the game) is like a nested collection of short stories, curled around each other like snakes in a jar. Each one is unique ... and all of them share one terrible, final thing in common. Deaths that you don't see coming. Deaths that you can't help but see a mile off. Death by a starving imagination. Death by irony. Death by being eaten by monsters. As Edith winds her way through the maze of the house (each tale linked by secret passages through which she shimmies and crawls), she witnesses every single one of them. As the player, we play through them — becoming (at various points) a cat, a fish, a boy on a swing, a crazy uncle in the basement, a child who opened a door and vanished into another world — but there's more to it than that because each of the stories has something else in common, too: Inevitability. Edith Finch is not open world. It is interactive fiction, operating on rails from end to end. You can explore, putter around, take your time, but eventually, it is back to the task at hand — and that task is awful. Look, there are stories I want to tell you. That I want so badly to tell you. I want to sit down with you and talk for hours about the brother who worked in the cannery (his tale being one of the single best and most affecting pieces of literature I have experienced in years, in any medium) or be there with you when the youngest of the Finches gets their story told just so you have somebody to turn to when you realize (slowly, agonizingly) what you are going to be forced to do and how it will end. I'm not the same person after playing. I've got new scars that haven't yet healed. And I'm not sure if they ever will. But I can't. You have to see them for yourself. For me to say anything would ruin the primary joy of Edith Finch, which is to experience something as an adult the way you used to experience books as a child — to see them open up in your head. To inhabit them the way you would another world. There is nothing in the world quite like What Remains of Edith Finch. When I started this little Reading the Game project, its purpose was to explore the intersection between gaming and literature — the ways story is defined and narratives presented in a medium where none of the rules are written in ink. I've talked about games that succeed and one that failed. Games that break new ground or redefine old conventions. But this game — this deadly little masterpiece of next-gen storytelling that you will hold in your belly like a ball of barbed wire and fishhooks for the rest of your life — is the one that sets a new high-water mark. I'm not the same person after playing. I've got new scars that haven't yet healed. And I'm not sure if they ever will. Now you have to go get some of your own. Trust me. It'll be worth it.